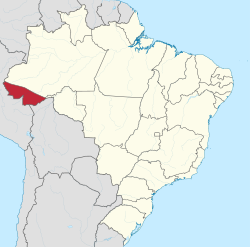 Acre (Brazilian Portuguese: [ˈakɾi]) is a state located in the northern region of Brazil. Located in the westernmost part of the country with a two hours time difference from Brasília, Acre is bordered clockwise by Amazonas to the north and northeast, Rondônia to the east, the Bolivian department of Pando to the southeast, and the Peruvian regions of Madre de Dios, Ucayali and Loreto to the south and west. It occupies an area of 152,581.4 km2. The region of present-day Acre is thought to have been inhabited by Pre-Columbian civilizations since at least 2,100 years ago. Evidence includes complex geoglyphs of this age found in the area, which also suggest that the natives who crafted them had a relatively advanced knowledge on this technology. Since at least the early 15th century, the region has been inhabited by peoples who spoke Panoan languages; their territory was geographically close to the Incas. In the mid-18th century, the region was colonized by the Spanish and became part of the Viceroyalty of Peru. Following the Peruvian and Bolivian wars of independence, which ended in 1826, the region and large portions around it became part of Bolivia. It was a territory of the short-lived Peru–Bolivian Confederation (1836–1839), until the two countries separated again and the region returned to Bolivian control. The discovery of rubber tree groves in the region in the mid-19th century attracted more immigration, and this included particularly Brazilian exploiters. Despite the increased numbers of Brazilians, the Treaty of Ayacucho (1867), determined that the region belonged to Bolivia. By 1877, Acre's population was almost entirely Brazilians coming from the Northeast. In 1899, Brazilian settlers from Acre created an independent state in the region called the Republic of Acre. Bolivians tried to gain control of the area, but Brazilians revolted and there were border confrontations, generating the episode which became known as the Acre War. On November 17, 1903, with the signing over and sale in the Treaty of Petrópolis, Brazil received final possession of the region. Acre was then integrated into Brazil as a territory divided into three departments. The territory passed under Brazilian sovereignty in exchange for the payment of two million pounds sterling, land taken from Mato Grosso and in accordance with the construction of the Madeira-Mamoré railway. Having been united in 1920, on June 15, 1962, it was elevated to the category of state, being the first to be governed by a woman, the teacher Iolanda Fleming. On April 4, 2008, Acre won a judicial debate with the state of Amazonas in relation to the dispute surrounding the Cunha Gomes Line, which culminated in the annexation of part of the municipalities of Envira, Guajará, Boca do Acre, Pauini, Eirunepé and Ipixuna. The territorial redefinition consolidated the incorporation of 1.2 million hectares of the Liberdade, Gregório, and Mogno forest complex to the territory of Acre, which corresponds to 11,583.87 km2. Members of an uncontacted tribe encountered in 2008. Rio Branco International Airport is located in a rural zone of the municipality of Rio Branco, in the state of Acre. It was opened on November 2, 1999, with a unique characteristic: it moved 22 kilometers away from the previous airport site. Rio Branco Airport serves domestic and international flights (by scheduled carriers and air taxi firms) along with general and military aviation. The terminal can receive 270 thousand passengers a year and serves an average of 14 daily operations. Cruzeiro do Sul International Airport is located 18 kilometers away from the city center, which helps access to the Alto Juruá region. It was opened on October 28, 1970, and absorbed by Infraero on March 31, 1980. The airport infrastructure was built in 1976 by the municipal government. In 1994 the runway was totally renovated. ^ The European Portuguese pronunciation is [ˈa.kɾɨ]. ^ Martti Pärssinen, Denise Schaan and Alceu Ranzi (2009). "Pre-Columbian geometric earthworks in the upper Purús: a complex society in western Amazonia". Antiquity. 83 (322): 1084–1095. ^ a b "Unnatural Histories - Amazon". BBC Four. ^ Junior, Gonçalo (October 2008). "Amazonia lost and found". Pesquisa (ed.220). FAPESP. ^ Treaty of Madrid "Tratado de Madri"
^ "Fixação e consolidação da fronteira" Official Site of the Legislative Assembly of Mato Grosso. Page visited on October 05, 2010. ^ "Tarauacá: Ontem, hoje e amanhã" Tarauacá.com. Page visited on October 05, 2010. ^ "História de Ipixuna". Official site of the Public Library of Amazonas. Page visited on October 06, 2010. ^ "As Casas Aviodoras" WEB High School. Page visited on October 06, 2010. ^ a b c d e f g h i j k l m n GURGEL, Rodrigo. "Revolução Acreana: Bolívia e Brasil disputam o Acre". UOL Education. Page visited on October 06, 2010. ^ "Tratado de Ayacucho" Wikisource in Portuguese (March 27, 1867). Page visited on October 09, 2010. ^ ALBUQUERQUE, Kátya Fernandez. "A Questão do Acre" Official site of the Fluminense Society of Philologic and Linguistic Studies. Page visited on October 09, 2010. ^ SILVA, Hiram Reis e (June 20, 2009). "Tenente-Coronel Gregório Taumaturgo de Azevedo" Archived 2011-07-15 at the Wayback Machine Roraima in Foucus. Page visited on October 09, 2010. ^ a b "História de Porto Acre IBGE Library. Page visited on October 09, 2010. ^ a b c SCILLING, Voltaire. "A Expedição dos Poetas" Earth Education:History. Page visited on October 09, 2010. ^ "Plácido de Castro" UOL Education. Page visitetd on October 09, 2010. ^ SILVA, Leo. "Plácido de Castro, Rio Branco e a Questão do Acre Official site of the Secretary of Education of the State of Rio de Janeiro. Page visited on October 09, 2010. ^ "José Maria da Silva Paranhos Junior". Official site of the Ministry of Foreign Relations of Brazil. Page visited on October 09, 2010. ^ FREITAS, Newton. "Nacionalização Boliviana". Official site of the author. Page visited on October 09, 2010. ^ "A História do Estado do Acre, região Norte do Brasil - fotos e dados que ilustram este tema". Hjobrasil.com. Page visited on October 9, 2010. ^ "O Ciclo da Borracha". Suapesuisa.com. Pge visited on October 9, 2010. ^ "Governador Binho Marques fará revista às tropas da PMAC". Official site of the State of Acre (May 24, 2007). Page visited on October 09, 2010. ^ LOUREIRO, Antonio José Souto (2008). "Histórico do Grande Oriente do Amazonas". Official site of Masonry in Amazonas. Page visited on October 09, 2010. ^ ANDRADA, Antônio Carlos Ribeiro de (16 de julho de 1934). "Constituição da República dos Estados Unidos do Brasil de 1934" Official site of the Presidency of the Federal Republic of Brazil. ^ VIANA, Fernando de Mello (September 18, 1946). "Constituição da República dos Estados Unidos do Brasil de 1946" Official site of the Presidency of the Federal Republic of Brazil. Page visited on October 09, 2010. ^ FRIGOLETTO DE MENEZES, Eduardo. "A Sudam – Superintendência do Desenvolvimento da Amazônia". Official site of the author. Page visited on October 09, 2010. ^ Síntese de Indicadores Sociais 2007 (PDF) (in Portuguese). Acre, Brazil: IBGE. 2007. ISBN 85-240-3919-1. Retrieved 2007-07-18. ^ "estimativa de 2009 do Instituto Brasileiro de Geografia e Estatística". Instituto Brasileiro de Geografia e Estatística. 30 March 2010. Retrieved 26 June 2010.